VoIP troubleshooting is hard. TotalView makes it easy. 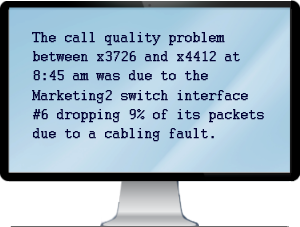 TotalView® identifies the root-causes of call quality problems, telling you exactly when, where, and why packet loss occurs in plain-English. Problems get solved the first time they occur. TotalView’s Call Simulator tool allows for unlimited packet loss tests. TotalView quickly identifies the root-causes of call problems in plain-English. TotalView® bridges the gap between monitoring and resolution, telling you exactly when, where, and why a call quality problem occurred in a matter of minutes. Analyzes all corners of the network and beyond, to third party carriers. Identifies the root-cause of call quality problems in plain-English. Assesses network readiness for VoIP implementation and deployment. TotalView solves all your VoIP performance problems, delivering reliable phone service at the lowest possible cost. TotalView’s Prescription Engine continuously tracks the health and performance of every device, router, and link in the network, telling you when, where, and why problems occur as well how to resolve them. Identify issues before they become problems, make your UC resources more productive and your VoIP network more efficient, virtually eliminating poor quality or dropped calls. Most performance management tools take days or weeks to deploy, but TotalView deploys in less than an hour. It automatically discovers your network, configures itself, and starts monitoring. Spend less time setting up the system—spend valuable time improving the network. With TotalView, most organizations find and resolve more problems on their VoIP network within the first few minutes of deployment than have been resolved in the previous year. Issues are identified before they become problems, network performance is always optimal, and the UC team is more productive—making the most out of your infrastructure investment. Power over Ethernet (PoE), which delivers power over LAN cabling to network devices, is one of the most widely deployed technologies. While the benefits of PoE are substantial—in terms of cost savings, ease of deployment, improved energy efficiencies, and reliability—until now there has been no automated way to monitor and manage the power status and usage of PoE switches. Full PoE monitoring at both the device and port levels is supported, enabling you to easily identify, manage, and monitor high power drawing devices as well as proactively troubleshoot power faults. Most companies and organizations are tasked with doing more with less and budget constraints, in up or down economies, are always an issue. With TotalView, it’s as if you have an extra senior-level UC engineer working just for you as it automatically monitors all switches and routers, finds and diagnoses problems, and recommends fixes. Network maps, dashboards, and drillable reports show the performance of every router, link, and device on your network. Take users out of the notification loop. Instead of waiting for someone to log a problem, you are immediately notified when link or device failures or excessive utilization rates occur. No need to track the location of new or existing phones. TotalView does this for you. Simulate any number of VoIP calls from one location to another so you can easily plan for network expansions and validate what you need to support them.